Monitors in System Center 2012 – Operations Manager can do more than notify you of problems by sending an alert. Some monitors also provide diagnostic and recovery tasks to help investigate and resolve those problems. A task is a script or other executable code that runs either on the computer running the Operations console or on the server, client, or device that is being managed. Tasks can potentially perform any kind of activity, including restarting a failed application and deleting files. Monitors can have two kinds of tasks associated with them: diagnostic tasks that try to discover the cause of a problem or provide you with additional information to assist with that diagnosis, and recovery tasks that try to fix the problem. Diagnostic and recovery tasks can run a script or command line executable. These tasks can be run automatically when the monitor enters an error state, providing an automated way to solve problems. Diagnostic and recovery tasks can only be created for a specific monitor. A diagnostic or recovery task that you create for one monitor cannot be shared with or associated with a different monitor; you must recreate the task for each monitor. In addition, tasks that you create in the Authoring workspace using the Create Task Wizard cannot be used as a diagnostic or recovery for a monitor. For example, the Health Service Heartbeat Failure monitor has several diagnostic and recovery tasks associated with it. The following list provides a sample of the tasks associated with the monitor. These are diagnostic tasks that run automatically when the state for this monitor changes to critical (red). This is a recovery task that runs automatically when the Ping Computer on Heartbeat Failure task succeeds. This is a recovery task that you can run manually or you can enable it to run automatically by using an override. 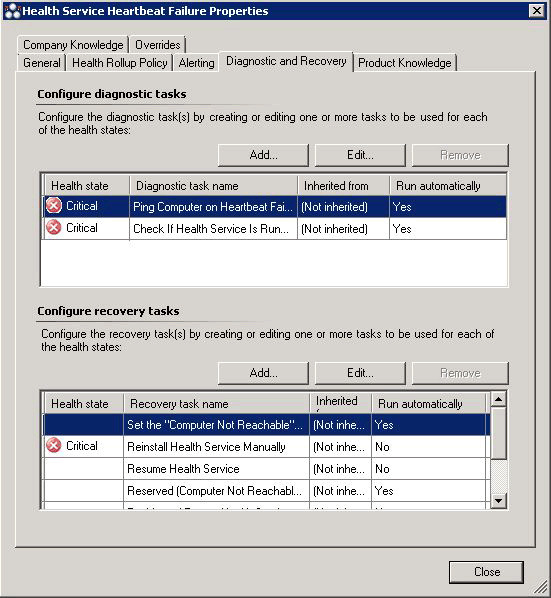 You can see the tasks available for a monitor on the Diagnostic and Recovery tab in the properties of the monitor, as shown in the following illustration. On this tab, you can also add tasks or edit tasks that you have added previously. For more information on how to add diagnostic and recovery tasks, see Diagnostics and Recoveries in the Author’s Guide. Tasks that are configured by a sealed management pack can only be modified by using overrides. For more information, see How to Enable Recovery and Diagnostic Tasks.